We experienced an unfortunate coincidence earlier today when two of our visitors did not get along. Tuesday is the day when I open my home to an informal Mum’s group, and yesterday was also marked by a very public visit from a snake. Our snake-detecting dog was the first one who spotted the snake, giving an unusual bark and acting strange. I recognised the dog’s language and immediately said to David, “There’s a snake out there.” David had a cursory look and didn’t see anything. However, I knew one was there (Misty has previously alerted us to snakes inside and outside the house) and so was going out to look for myself when David spotted the carpet python. After ascertaining that it was not a “dangerous” kind, David took the girls out to have a look. 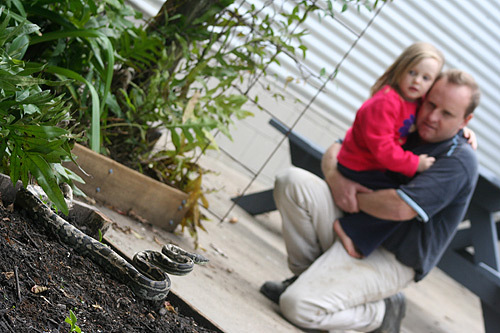 The carpet python had probably come out to sun itself and was partially coiled in our new garden-bed. The carpet python is (relatively) harmless, and a protected species in Australia. After the photo shoot, David shooed it back into the garden. However, it was just unfortunate that the mum who was here at the time has an unnatural phobia of snakes. She was not impressed and probably even horrified at the way we eagerly rushed our small children out to the snake’s proximity. After today’s incident, I don’t think I’ll be able to persuade this friend to venture out into the back yard every again!